It has taken me a very long time to write something for Malmo & Moss's blog, as I am fairly certain that there is not much demand for my idea of winter fashion, which involves wearing a half dozen jumpers in black, shades of grey and navy on heavy rotation until I feel warm again, i.e. mid May, or they develop (noticeable) holes on the elbows. However, I will happily ditch my much-loved woollens for a party – including the big daddy of them all, New Year’s Eve. Then I think it’s kind of nice to reach for something a little more luxe, be it velvet, sequins, leather, metallics, silk … anything goes, really. Purely in the interests of research (ahem), I have scoured the High Street for some festive gorgeousness to help you choose your New Years Eve look. Bonus – some of it is now on sale too. Here is my round up of the pick of the lot, with no single item coting over £150 as I appreciate that a lot of you have a serious soft furnishings habit to feed too. I love a velvet suit. 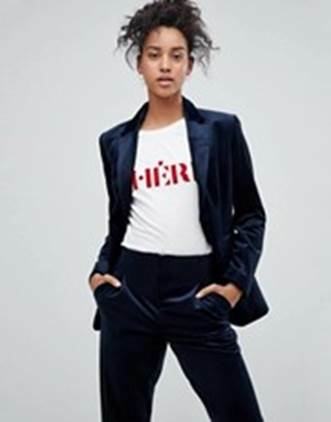 If you got your hands on this dreamy, high waisted tux by &Other Stories this season, which sold out in what seemed like a nanosecond, then lucky you, as I think it’s perfect. I also really like this slightly more relaxed, navy suit by ASOS and, if a suit is not so much your thing, these black velvet culottes from Sandro (both on sale). I’d tuck a silky top (like this satin pyjama style blouse from Topshop) into the culottes and add some simple, strappy heels for an easy evening look. I think the ASOS suit would look pretty cool dressed up with a silky vest, or dressed down with a T and a pair of flats as well. There are more oversized blazers than you can shake a stick at in the stores at the moment. This tux-y looking, tailored one by Pepe Jeans (via ASOS) above caught my eye, and would really suit a mini. There are also some great looking sequinned dresses in the stores this season, including this crew necked, long sleeved version from H&M. Sequins can be a bit Marmite, so if they are not your thing, you could wear the blazer with a leather mini instead, like this high waist one from French Connection, and maybe a loose, fine knit jumper or a vintage T. I’d top the outfit off with some ankle boots (I really like these white leather ones from Topshop). “But it is too cold to go out in a mini, you fool!”, I hear those of you who were born south of Watford cry. I am a sucker for a dress with long sleeves and leopard print, so I bought this leopard dress from Zara as soon as I saw it. It is very flattering on and a great length (somewhere between a midi and a maxi – a mid midi maxi?!). I wear it with my trusty black, pointy ankle boots. I also really like pyjama suits, and I think this one from H&M, with its exotic print and red piping, looks way more spendy than it actually is. To add a bit of boom to these looks, I’d add some big old earrings, like these ones from Mango (although be careful you don’t have someone’s eye out on the dancefloor and avoid leaning over any lit candles). Lastly, I adore these sequinned, cropped trousers from Miss Selfridge’s premium range, which are now half price in the sale. Admittedly, they are a little blingy, so I’d dress them down with a snug, black turtleneck and some suede heels, like these from Topshop. The oversized blazer would work well with these trousers too. So there you have it – my little round up of this season’s festive party wear. Ultimately, of course, the best party outfit is the one you feel awesome in, whatever that looks like. This explains why I will more than likely end up wearing the camo print boiler suit I have just snapped up in the sales to my NYE dinner with friends, along with the mega sized Mango earrings … It’s like I said at the outset, anything goes! Happy new year!